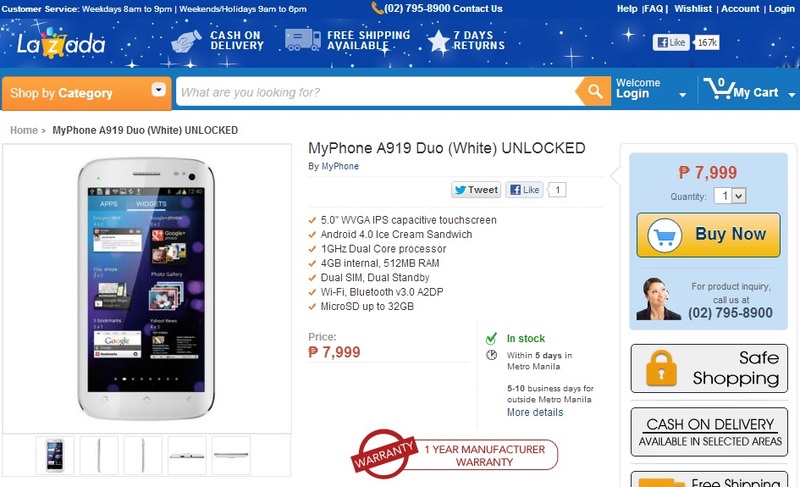 November 16, 2012 - Finally, MyPhone's Biggest Revelation has arrived! MyPhone just unveiled via their Facebook page their biggest and most powerful smartphone to date called the MyPhone A919 Duo. We already teased the rumored A919 Duo since October and were right all along from the specs, looks and price! According to MyPhone, the phone will be available starting next week on MyPhone kiosks, stores and other cellphone retailers nationwide for only Php7,999! MyPhone also said that they didn't rebrand the Micromax A110 Superfone Canvass 2 from Indian telecommunications company Micromax, but according to them they have the same OEM manufacturer with Micromax. More about the MyPhone A919 Duo specs and features after the jump. 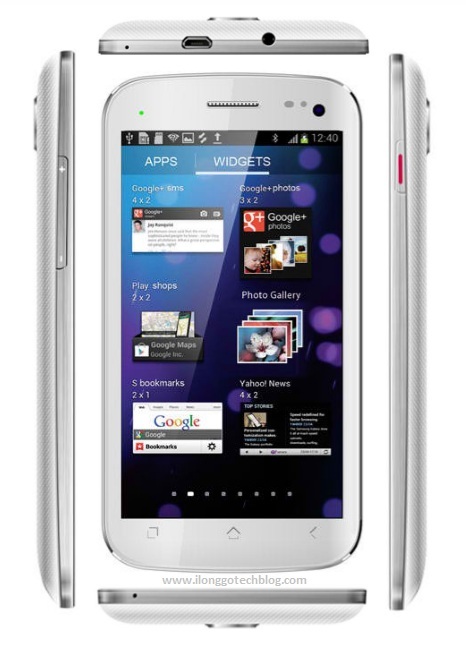 The MyPhone A919 Duo comes with dual-SIM connectivity and Android 4.0.4 ICS. Other features of the smartphone include Giant 5-inch FWVGA (854x480) IPS display with AGC Sodaline screen protection (adds extra level of safety to the display from scratches ,dust ,etc. ), 1GHz dual-core MediaTek MT6577 processor (Same with the Cherry Mobile W500 Titan, MyPhone A898 Duo and Starmobile Astra), 8MP autofocus rear camera with dual LED flash, 720p HD video recording and a VGA front camera. On the connectivity front, the smartphone supports EDGE, GPRS, GPS, WiFi, Bluetooth 3.0, WiFi Tethering hotspot, USB 2.0 and the most important feature, 3G (HSDPA, HSUPA) connectivity! There is a removable 2,000mAh battery on-board too. Availability/ Release Date: November 23, 2012! 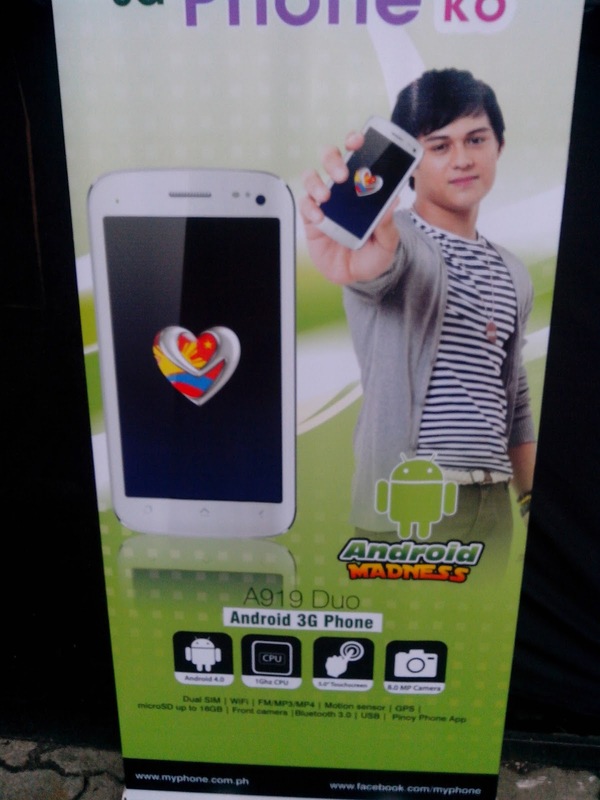 (10/30/12) MyPhone A919 Duo Poster. Thanks Harold Dela Fuente for the photo! October 28, 2012 - MyPhone is on the edge of releasing its biggest and most powerful Android smartphone to date, but the only problem is there's no information about it on the web. Luckily, I stumbled upon a teaser photo of the MyPhone A919 Duo from noypigeeks.com and after some searching on the web, I found out that the MyPhone A919 Duo have the same specs and overall physical appearance with that of the i-mobile IQ 5 of Thailand, Beidou Chi K from China and Micromax Superfone Canvas 2 A110, one of the highly anticipated phablets from Indian telecommunications company Micromax! Won't believe it? Try looking at the photo below and see how similar the MyPhone A919 Duo with that of Micromax A110. What do you think of the touch panel? The same? Yup, it will be erased and your phone will be reverted to its factory settings. Oh okay. But does it affect the installed applications? For 5 months after they have a returned it we didn't encounter any problems on his phone. Btw, the service center was actually a Sony Center, since Solid Group owns both. But did he encountered the same thing again after his phone was being returned? Your problem is just like what we encounter with my friend A919 (No signal and the same problem with yours) and it took only 2 days before it was returned to us. Seems like something had been burned inside, was it normal? I guess not. I just hope that it wont take that long for them to check and repair in case. Hi Sussane, I think you have to bring it to their service center to have it check. Hello there! I'm having a hard time with myphone a919 duo. It was drained and so I charge it, but when I opened it, it only displays the logo of myphone and nothing else. I have kept it that way for few hours thinking that the phone was still reading all the memory card and all installed applications. I also have remove the battery, sim card, sd card a lot of times yet nothing happened. What to do with this one? Please help me on this. Thanks. http://www.gsmarena.com/micromax_a110_canvas_2_is_getting_jelly_bean_next_week-news-5659.php update lang sa mga di pa nakakaalam. Ito po yung bilhin mu http://www.cdrking.com/index.php?mod=products&type=view&sid=14896&main=154 -> wala ko pa yan na try dahil not available pa po ito dito samin. Join ka din dito https://www.facebook.com/groups/369478116470886/ dahil marami na sa MP A919 users yung nka gamit nito at yung TV-out feature. sir adrian ask ko lng pano gamitin yung tv-out sa my phone a919 ano ba ang kelangan na jack o connector?nag try kc ako mag connect sa led tv thru usb hnd cia nag function? Is it true that it can only pump @ 30Hz? Autofocus po yung cam ng A919 Duo at 8MP pa po ito, join ka po dito https://www.facebook.com/groups/429941820392764/ (My|Phone A919 Photography) marami dyan sample photos na kuha ng A919. At laki po yung difference ng single core sa dual core. BTW, Join ka po dito https://www.facebook.com/groups/369478116470886/ <- MyPhone A919 Duo Users po lahat nsa loob ng group na yan. At tumulong din cla po kapag meron ka problems. plano ko bumili neto a919.. pero gusto ko din ng xperia ray/neo..
ano ba mas maganda? habol ko kasi maganda camera,, malaki ba difference ng single core sa dual core? malinaw at nag o-autofocus din ba cam ng a919.. may macroshot din ba a919? sir lahat b ng a919 duo na lumbas 30fps?.. prang mas maganda un 898 duo? . Opo lahat po, sabi ng nkagamit sa UI (Default launcher) lng po yung lag at sa games po 60fps nmn po ito. sir lahat b ng a919 duo na lumbas 30fps?.. prang mas maganda un 898 duo? ..
Bka ICS pa rin, wait lng natin sa December.. Same po yung processor, GPU at RAM ng A898 at A919. Yung A919 Duo nmn po meron 5-inch IPS display (yung resolution po nd pa yan official), 8MP camera (Same with Starmobile Astra), meron itong AGC Sodaline Screen Protection (to be confirmed) at yung battery capacity po ay 2,000mAh (1,800mAh lng po sa A898 Duo) at mas maganda po ito kaysa sa MyPhone A898 duo. Yan din po ang sabi nila, yung release date nmn po ay sa first week of December (rumored din po ito). Mas mabilis ung a898 kaysa a919. Halata po kapag nauna mu ngamit yung A898 Duo. mada raw nagrereklamo dahil sa FPS at sa SD. Totoo po yun, ito po yung benchmark ng MyPhone A919 Duo (30.12fps) at MyPhone A898 Duo (59.21fps). Hi Sir, sa Iloilo available na po ito since November 23, sa Kalibo po wla ko idea if meron na. Yes, here's a what tjsdaily.com said in reviewing the gaming capabilities of the MyPhone A898 Duo, same po yung processor, GPU at RAM ng A898 at A919 kasi. MERON BA ITONG 10' SCREEN? Gagana po yan, ito po yung advice ng nkagamit ng Skype sa A919 Duo "dapat maganda ang lighting and mabilis wifi"
Micro sim na po ba ang A919?